SCVHistory.com LW2472 | William S. Hart | Bill Hart Monument (Range Rider Statue), Billings, Mont. "A Range Rider of the Yellowstone" by Charles C. Cristadoro at the municipal airport in Billings, Mont. (Later reprint of) The Signal, 9/3/1925. Bronze, 6-foot 7½-inch statue depicts William S. Hart, who commissioned the piece for $20,000. Modeled from life. Cristadoro was working on the sculpture in Newhall in late August-early September 1925. At the time, Hart would have been living in the ranch house at the bottom of he hill where he'd soon build his mansion. "A Range Rider of the Yellowstone" was made from life and posed by William S. Hart and his horse. It was donated to the city of Billings by Mr. Hart and was dedicated July 4, 1927, the 45th anniversary of the founding of the city. The figure expressed by Mr. Hart as "a symbol of the old cattle days of the valley of the Yellowstone," looks with far-reaching eye over the country made famous by the Fort Dodge Trail, the Texas Trail days and the extensive cattle ranching operations which followed them. Although the plaque says Hart donated the statue, the Smithsonian American Art Museum's Inventories of American Painting and Sculpture notes that another nearby plaque says the statue was donated by a Mr. and Mrs. John Popovich. The Smithsonian also records a discrepancy in the date of execution of the statue: A 1988 report from the Hart Museum says it was sculpted in 1927, while a 1994 survey of outdoor sculpture in Montana gives a date of 1926. According to Smithsonian records, both Hart and his horse Fritz attended the dedication on July 4, 1927. A sculptor of character models for The Walt Disney Co. in the 1930s and '40s (Pinocchio, Dumbo and more), Charles Cristadoro was a second-generation Italian American born Nov. 18, 1881, in New York City. His father was a successful writer. Charles developed an interest in sculpting at the 1893 Columbian Exposition and eventually made it into the Art Students League. Long story short, he ended up in Los Angeles and was hired to work on a sculpture in the 1915 Pan-Pacific Exposition in San Francisco, specifically a kneeling figure that was part of the Tower of Jewels. 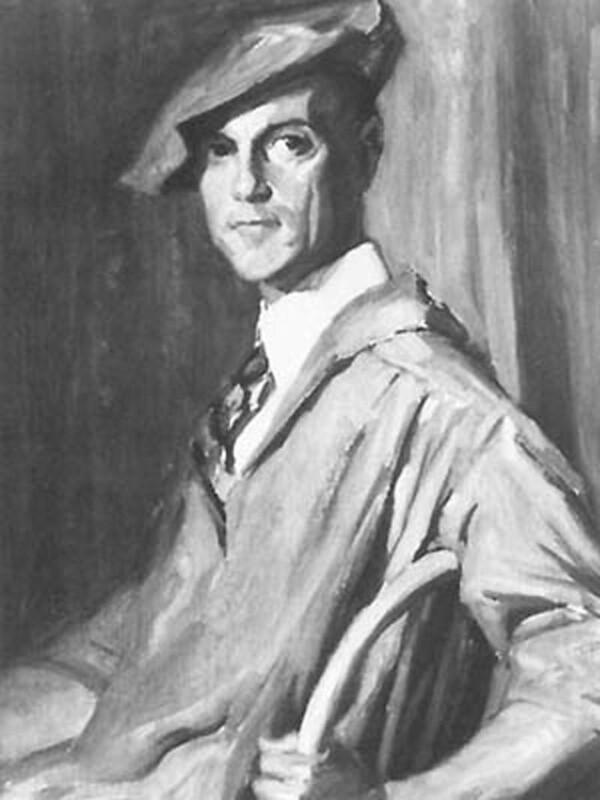 Portrait of Charles "Cris" Cristadoro by San Diego-area artist Aloys Bohnen, early 1920s. Painting destroyed in a fire at Bohnen's Point Loma studio. Source: San Diego History Center. Cristadoro's next big assignment came from cowboy megastar William S. Hart. Cristadoro would work on a set of miniatures, one of which was a depiction of Hart carved out of a billiard ball, which were carved out of ivory and bone. The miniature Hart carving is two and one-eleventh inches in height, 46,676 times smaller than Hart. The miniatures garnered enough attention to have a full page dedicated in Vanity Fair. Cristadoro worked for Hart over the next fifteen years, creating numerous sculptures. Most famous are his Two-Gun-Bill and Range Rider of the Yellowstone. The Bronze version of Two-Gun-Bill would have a number of copies made. In 1926, the three-foot statue would become the "Bill Hart Trophy," awarded to the winner of the saddle bronco competition at the 1925 Cheyenne Frontier Days Rodeo. Billy Wilkinson was awarded the trophy, the only recipient. Hart's generosity was not repeated in subsequent years and did not initiate a tradition. Range Rider of the Yellowstone cost Hart $20,000 out of his own pocket, equaling almost a quarter of a million dollars by today's standards. More than just the price was hefty. The bronze statue was massive, the finished product measuring 6-foot, 7.5-inches in height. "The artist has caught a look of distance in the eyes that would match the location we seek," Hart said of Cristadoro's piece in September 1926, "as though the work was modeled on that very spot where God made life in death." His final favor to Hart was to create a bust of mutual friend C.M. Russell for Nancy Russell and the C.M. Russell Museum. The Russell bust is still on display on that old cedar post sent to Cristadoro by Nancy Russell. Read Romo's full biography of Christodoro here. 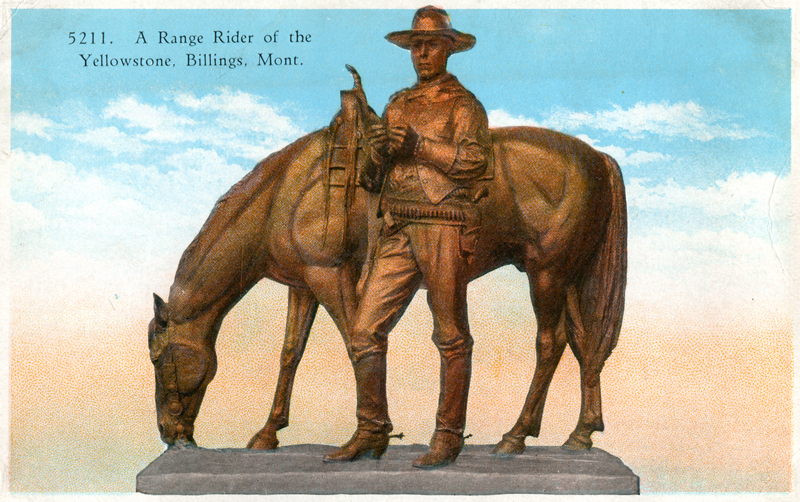 The Bronze Statue "A Range Rider of the Yellowstone" is located on the Rimrock at Billings, Mont. Total height 6 ft. 7½ inches. This statue was posed by William S. Hart and his horse, and is typical of an early day Range Rider. LW2472: 19200 dpi jpeg from original postcard purchased 2013 by Leon Worden.